Cycling in East Tennessee means rolling hills and dramatic vistas, meandering routes along beautiful rivers and creeks, and spectacular scenery on roads, greenways and trails. Knoxville offers an infinite array of byways which offer everything from a leisurely scenic stroll with the family to challenging tracks for the adventurous cyclist. We have over 65 miles of greenways perfect for the recreational biker or adventure enthusiast as well as challenging, hilly roads and trails for those looking for a more thrilling experience. No matter whether you're looking for traffic-friendly road cycling, singletrack or doubletrack mountain biking, or child-friendly, safe-routed bicycling greenways, Knoxville has the avenue you need to get your "bike-on!" Knoxville’s love for biking is evident and quite possibly at an all-time high. Knoxville will host the USA Cycling Pro Road and Time Trial National Championships for a second consecutive year in June 2018. 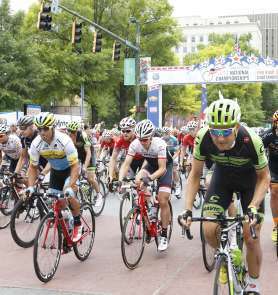 This year, the Crit Championships will take place in Knoxville as well. Watch the U.S. Professional Road & Time Trial National Championships, participate in Pedal for the Red & join us at the Cycling Expo!